Downing Street has commented on President Donald Trump's retweets of videos posted by the deputy leader of the "hateful" far-right group Britain First. The statement came as British MPs condemned the US leader. Prime Minister Theresa May's spokesman said to NBC on Wednesday: “Britain First seeks to divide communities in their use of hateful narratives which pedal lies and stoke tensions. This causes anxiety to law abiding people." "British people overwhelming reject the prejudice rhetoric of the far-right, which is the antithesis of the values that this country represents; decency, tolerance and respect. It is wrong for the president to have done this," he said. Downing Street added that Trump's scheduled state visit to the UK would go ahead. 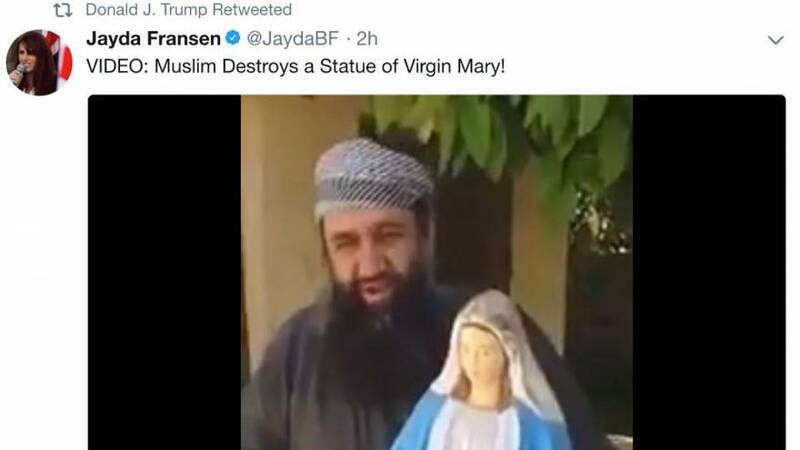 The three clips, showing alleged incidents involving Muslims, were posted by Jayda Fransen on her personal account and shared by @realdonaldtrump without comment. When reporters asked White House press secretary, Sarah Huckabee Sanders, about the videos being taken out of context, she said the they were "focusing on the wrong thing" and that the "threat is real". Chuka Umunna, a Member of Parliament from the opposition Labour party urged the government to respond by withdrawing an invite extended to Trump for a visit next year. "I don't think the president of the United States, a president who has not only promoted bigotry, misogyny and racism in his own country, I don't think he is welcome here," Umunna told Sky News. In a strongly worded tweet, Conservative Party MP Sajid Javid hit out at Trump for endorsing "the views of a vile, hate-filled racist organisation that hates me and people like me." Scottish Conservative leader Ruth Davidson tweeted her agreement, writing: "Absolutely, Saj." Jeremy Corbyn, leader of the Labour Party, described Trump's action as "a threat to our society." One of the clips shared by Trump shows a young man with a dark complexion attacking another, lighter skinned man on crutches. The title identifies the attacker as a Muslim migrant. The Dutch Embassy in the United States intervened, fact-checking the president and claiming that the perpetrator in the video was born and raised in the Netherlands - and had been brought to justice. Earlier a Dutch video sharing site also claimed that the man in the film had been arrested and was neither a Muslim nor an immigrant. Another shows a bearded man smashing a statue of the Virgin Mary. It was published in 2013 on memri.org. The third video shows a mob throwing a group of men from a rooftop. It was filmed in 2013 in Egypt during the overthrow of president Mohamed Morsi, according to Buzzfeed. An Islamist supporter of the former president was subsequently executed for the crime. The anti-immigration Britain First has put up candidates in UK local and national elections but with little success. Its leadership had belonged to the better-known British National Party but split in 2011 and gained media attention through fiercely anti-Islamic rhetoric and rallies involving dozens of supporters. Its founder, Jim Dowson quit the group, in 2014 after the group launched what it described as "invasions" of mosques. At the time he said the group had been "overrun with racists and extremists".